I first heard about the MacKenzie Repeater in 1968. By then, it was already an antique, having taken its place with 16-inch transcription turntables, wire recorders, soft-cut acetates and other early machines and technologies that were used to record and reproduce sound in the 50's. What made the MacKenzie machine so special is that it was used in Top-40 radio stations, just prior to the emergence of the continuous loop tape cartridge. The venerable "cart", of course, began its ascension to the standard for broadcast stations in the early 60's. Recently, my interest in these mysterious contraptions was renewed by the Reel Top 40 Radio Repository, so I posted a message in the rec.radio.broadcasting USENET group, asking if anyone knew anything about them. I was delighted to hear from Graham Newton, a former RCA Victor mastering engineer and radio Chief Engineer. Graham now operates a digital audio restoration service in Ontario (www.audio-restoration.com.) Not only did he know what a "MacKenzie Repeater" was - he had sold the machines at one time and had original sales literature, AND, he still has two single-deck machines for sale! Much of the information in this Special Report is courtesy of Graham, and taken from MacKenzie sales materials, circa 1960, or thereabouts. Mysteries of the MacKenzie Repeater Revealed! The MacKenzie program repeater was offered in numerous configuations - with as many as 10 decks in a unit. 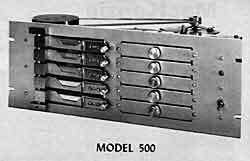 The popular Model 500 (shown) featured 5 decks and independent audio outputs for each. 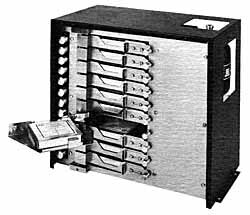 The unit used a common capstan, much like the ITC 3-Deck cartridge machines that became so popular in the '70's. A front panel volume control was provided for each deck. The tape itself was mounted in a metal "magazine", and sat on a hinged deck secured with a thumbscrew. Loosening the screw allowed the deck to "swing open", providing access to the magazine. THE MACKENZIE TAPE MAGAZINE MAKES THE DIFFERENCE. Patented, proven magazine design assures continuous, smooth tape motion. The tape runs freely, adjusts its own slack automatically and will not bind because the magazine turntable is POWERED. Tape stretch is eliminated and friction is reduced. This means extra-long tape life. Magazines are of metal construction and are operable indefinitely. Program material may be as short as one second or as long as 14 minutes. Wow! Think of the cool stuff you could do with THIS baby! It's the RANDOM ACCESS MULTI-PROGRAM REPEATER MODEL APR-20 with 10 decks. The magazines were two-track recordings, so one of these machines gave instant access to 20 different messages. (Of course, you could always have more than one message on any magazine, too.) The literature says: The instant start-stop capabilities of the APR-20 make it ideal for use in "talking elevator" installations, the synthesis of automatic announcements and as the "audio readout" of computer controlled programs. In fact, Louis G. MacKenzie, the inventor of this marvelous device, received a special technical citation for a "selective sound effects repeater" in the 1962 Academy Awards. His machines were a big hit in the film and television industries. One tidy, small MacKenzie Program Repeater could replace lengths of film strung over multiple sets of rollers so that a sound "dummy" could repetitively play continuous background sound effects for motion pictures. In television, Repeaters were used to provide "canned" audience response. And, for a few Classic Top-40 stations, Repeaters were used to provide quick access to those wonderful old jingles and wacky news effects. In our design, the turntable on which the mass of tape is supported is powered directly by the machine. When this turntable is driven at the correct speed, its radial velocity equals the lineal velocity of the tape on the inside of the spiral mass, and the outgoing tension on the tape is reduced to zero... It will be noted that the turntable is molded with a series of concentric rings of saw-toothed cross-sectional shape. Whenever an individual turn of tape gets inside one of the rings, it cannot back out. The mass of tape, therefore is broken into a series of concentric masses each isolated from the other by the concentric saw-tooth rings. Consequently, we now have a large number of thin endless loops each operating independently from the others, and we find that the tape no longer has any tendency to operate as one large mass and that the tape motion is uniform and smooth. 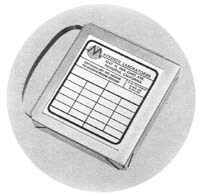 MacKenzie recommended lubricated tape, which was available with his very first machine. There are stories that several stations tried to use regular tape, lubricated with graphite. In early versions of the cartridge, the tape ran over a graphite post, but according to Graham Newton, "the soft graphite posts were intended to replace the tape lubrication that was lost as the tape surfaces repeatedly passed the external components (heads, tape guides etc.) of the machine. Lou Mackenzie never recommended using regular tape in the magazines, notwithstanding the existance of the graphite posts, because regular tape ran at much higher friction and invariably caused problems. The graphite posts in the magazines were replaced with nylon guide posts after some testing determined that the later stocks of lubricated tape did not need them." But the greatest "secret" about the MacKenzie Program Repeater is that hundreds of them were in use at Disneyland, as early as 1955. Enabled with the MacKenzie "Audio-Mation" feature, these machines provided "accurate and dependable synchronization of external devices with the audio program". So, the MacKenzie Program Repeater was part of the Haunted Mansion. For me, it will always be the mysterious and magic machine that enabled those remarkable and heavily "produced" newscasts of the Golden Era of Classic Top-40 Radio, before the continuous loop tape cartridge.